CALGARY ALBERTA, October 11, 2018- Lithium Chile Inc. (“Lithium Chile” or the “Company”) is pleased to announce it has encountered lithium bearing brines in three additional drill holes at its wholly owned Ollague Project, Chile. Results for OLL-01-18, OLL-02-18, OLL-03-18 and OLL-04-18 are outlined in the table below. Drilling continues to confirm the reliability of TEM geophysical profiles in identifying the brine carrying highly conductive zones. In addition, the drilling suggests that lithium grades increase with depth. Holes three and four were drilled on the northern block approximately 10 kms from hole one. These holes were located in the center of the salar rather than on the edge like holes one and two. The TEM surveys indicated that the conductive target zone was deeper in this sector of the north block. These brines tested lithium grades starting at 150 mg/l and increasing to 270 mg/l when the holes reached their 250 meters contracted depth. These grades were comparable to the grades seen in the upper 50-70m of the same TEM zone encountered in hole one. These improving grades as holes three and four were drilled deeper reinforces the company’s decision to test the deeper limits of the aquifer by drilling hole five. Hole two was drilled two kms south of hole 1 and entered the top of the structure at approximately 130 meters. Grades were increasing from 100 mg/l to 230 mg/l at 170 meters when the drill rods became jammed in the lose sand and gravels of the formation. Subsequent efforts to release the rods involving the pumping of large quantities of fresh water into the hole rendered further samples meaningless. Eventually the hole was abandoned as the rods were unable to be freed. Steve Cochrane President and CEO of Lithium Chile commented “We are extremely pleased that our drilling program continues to show good lithium grades. The fact these grades improve with the depth of the holes justify the company’s decision to target the much deeper zones on hole five. 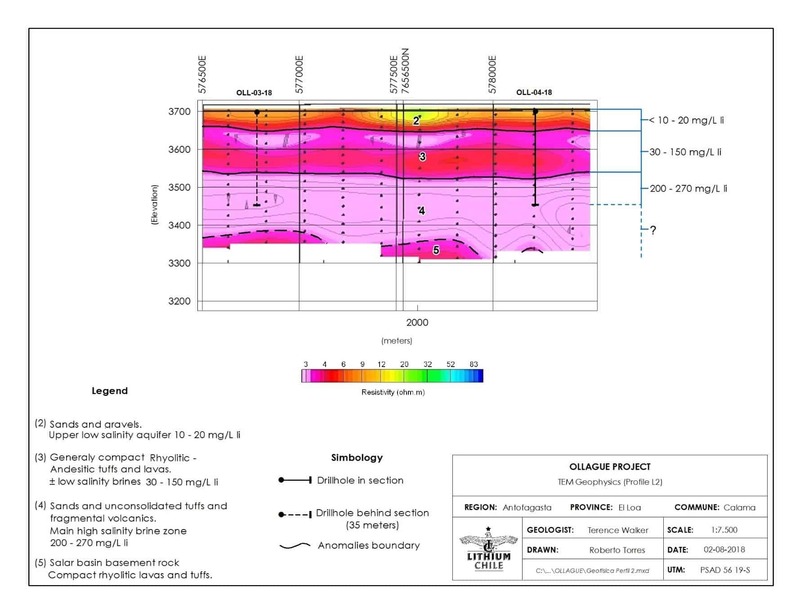 It is also important to note that with the drilling of holes one and two we have identified a 4 km2 zone on our southern block and with holes three and four a 10 km2 zone on our larger norther block with significant lithium grades”. Hole number 5 has been drilled to a total depth of 354 meters where complications with the drilling forced the abandonment of the hole. Samples were collected from 170 meters with the last sample having been taken at 350 meters. These samples will now be sent to ALS for analysis. Lithium Chile is also pleased to announce that the rig is now being mobilized from Ollague to the Salar de Coipasa in anticipation of our next drill program getting underway soon. Coipasa at 12,900 is our second largest property in the Andean lithium belt. Mr. Terence Walker, M.Sc., P.Geo, qualified person within the meaning of National Instrument 43-101, has reviewed the contents of this news release. Individual brine samples were collected at 20m intervals down hole bye means of a double valve bailer after the hole had been flushed. The brine samples were collected in new 1 litre screw top sterile bottles that were sealed and tagged at the sample site. All samples were shipped to ALS Patagonia Laboratories, La Serena, Chile, where they were prepared and then subsequently shipped to the ALS Laboratory in Vancouver, Canada where the brine analyses were performed. To find out more about Lithium Chile Inc., please contact Steven Cochrane, President and CEO via e mail: steve@lithiumchile.ca or alternately, Jeremy Ross, VP Business Development, at (604) 537-7556 or via email: jeremy@lithiumchile.ca . Lithium Chile has retained Nice Vice Capital Inc to provide marketing services.